Crystals of gmelinite, pink in color, with the characteristic triangular striations and prevalent development of dipyramide. The small dark brown spots, probably oxides, are inside the crystal. 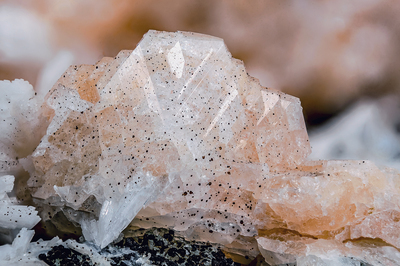 Bottom left, white crystals of laumontite. Ex IC Minerals, ex R.F. Denicourt, ex Parker Minerals (N.J), ex Adriana &Renato Pagano collections and, now, collection and photo of Gianfranco Ciccolini. Nikon D750, bellows, Luminar 40 mm.